Earlier this month, Joe Traina, a progressive organizer serving as campaign manager to congressional candidate Trent Nesmith, posted a letter he’d received from the Richmond County Democratic Party in Georgia informing him he’d been expelled from the party for seven years and suggesting he undergo mental health treatment. This was not the first time he received the letter—the first time, the day before, he’d ignored it. But this time, it arrived with something extra: a package containing bag of gummy penises and a note telling him to “eat a bag of dicks.” Both pieces of mail were sent on the same date, and Traina suspects—though he can’t prove conclusively—that they came from the same source. “My first response was humor. I knew that the letter was meant to scare me away, but the blue package was meant as an insult,” Traina said, explaining that the establishment of the party is “very religious” and “homophobic,” and noting that the progressives in the party had organized campaign events with the LGBTQ community two weeks earlier. According to Traina, the bad blood began with his efforts and those of his fellow progressives to push the local party to adhere to more democratic rules and committee bylaws. At a recorded meeting from November 2016, former chair Lowell Greenbaum threatened to call the police on the progressives. In another episode from the summer of 2017, Traina and his crowd found officers waiting for them at a meeting. “This is a personnel matter which is closed,” Mr. Greenbaum told us over email, declining to discuss either the decision or the bag of gummy penises. Traina’s experiences are hardly outside the norm. Across the country grassroots progressive activists, joining the Democratic Party in the hopes of changing it, have been met with pushback from establishment leadership. And while some resistance is to be expected, the ethically questionable nature of the reality has many scratching their heads. This month in St. Louis, for example, local Democratic Party officials proposed an amendment to the party’s bylaws which would oust any member who supported or endorsed candidates who run without the party’s approval. This proposal comes on the heels of Annie Rice’s victory over endorsed candidate Paul Fehler in the race for the 8th alderman position. Both Fehler and Rice had served as Democratic committee members for the 8th ward and had each nominated themselves for the party nomination. This left the decision in the hands of the other Democratic committee members who went for the more conservative Fehler. In response, Rice opted to gather enough signatures to make the ballot as an Independent. With substantial support from progressives and activist groups, she won the election with almost 60 percent of the vote. “They have been looking for a way to punish people for a while,” Rice told Paste in an interview. “This part of expelling people from the party has just come up since my situation, so it does feel like it’s retribution for me running.” She added that two other aldermen in St. Louis have won their offices as Independents, though Rice still identifies as a Democrat. 7th Ward Democratic Committee member Marie Ceselki, a supporter of Rice’s campaign, characterized the proposed rule changes as “the great activist purge,” on Twitter. The proposed amendments will be decided on during a June 2018 meeting. The St. Louis Democratic Party and Rice’s Democratic challenger, Paul Fehler, did not respond to requests for comment. Meanwhile, Democratic Party leaders in California have resorted to using questionable technicalities as a means of preventing progressives from formally challenging the party’s endorsements. The California Democratic Party’s bylaws stipulate that incumbents automatically receive the party’s endorsement for re-election unless a primary challenger acquires petition signatures from at least 20 percent of eligible participants at a pre-endorsement conference. The endorsement enables incumbents to receive funding and campaign resources for their re-election directly from the party. Stephen Jaffe, a progressive primary opponent to House Minority Leader Nancy Pelosi, obtained ballot signatures from 37 of 182 eligible delegates before the petition deadline on Jan. 19. The challenge was rejected because, unbeknownst to Jaffe or his campaign, the party had an extended list of 190 eligible delegates which it never provided. The added 8 delegates made the threshold 38 signatures. Jaffe appealed the decision but the California Democratic Party scheduled its review for July 2017, a month after the primary contest. California House Speaker Anthony Rendon’s primary opponent, Maria Estrada, experienced similar issues. She obtained 11 signatures for her ballot petition, one more than what is required to formally challenge the party’s endorsement of Rendon. Estrada alleges that the California Democratic Party provided a list of her signatories to Rendon’s campaign, which coerced two of them to send the party a letter asking for their signatures to be rescinded. Her campaign asserts this has never been done historically, and there are no party rules permitting ballot signatories to revoke their signatures. The California Democratic Party also scheduled her campaign’s appeal for July 2018, after the primary and state convention, effectively ensuring the party’s formal endorsement stood. Jaffe and Estrada formally filed their appeals on Feb. 15. In a statement provided to Paste over email, the California Democratic Party explained that the appeal process is adherent to the party’s bylaws. “The first opportunity for these appeals to be heard by Committee after the close of the open testimony period on Feb. 27 will be at the the next regularly scheduled meeting of the CDP Executive Board in July,” the statement read. 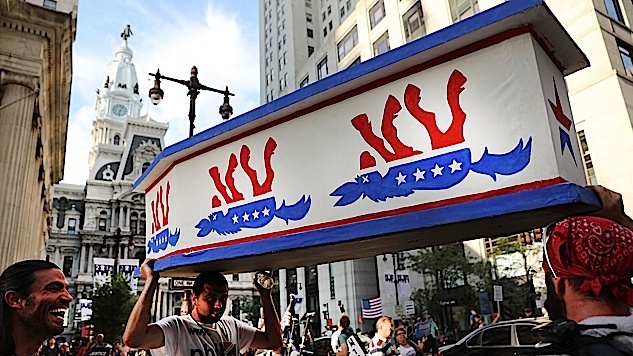 Despite the favorable outlook for the 2018 elections, the Democratic Party is in trouble. Trump’s election has not generated a registration surge, and the 2016 election left the DNC’s credibility so severely crippled that it has struggled to stay out of the red financially. This has placed the burden of fundraising squarely on the shoulders of the DCCC and Senate Democrats. According to a Gallup poll last month, most Americans have very little to no confidence at all in the party. That image is unlikely to change as new faces working to reform the party from within are met with resistance from establishment leaders who prefer to maintain the status quo.